Radiant Warmers are innovatively designed for use in Nursery, Labour & Delivery suits to provide quick & effective treatment for the newborn infants, who suffer extreme of heat loss. Our advance microprocessor based controller is loaded with a full spectrum of unique features to support the needs of your most special patient. Matching up the ever-changing needs of the patrons, we provide patrons with the superior quality of LED Phototherapy Stand. To treat indirect hyperbilirubinaemia in new born, the LED phototherapy is used. 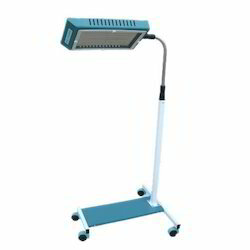 Easy operation, low power consumption and minimum maintenance cost, make the LED phototherapy stand highly appreciated and praised in hospitals and medical colleges. Low power consumption (12 W) compared to any conventional phototherapy system (120 W). LED's emitting blue light in 450-470 nm. Specturm matching peak absorption wavelength (458 nm.) at which bilirubin is broken down. Do not emit light in infrared radiation range reduction the risk of fluid loss. Long life > 20,000 hrs. Intensity: > 25 µW / cm2 / nm. Hevay duty mobile stand with hight adjustment facility & easy swivelling box when stand is to be used in conjuction with radiant warmer or infant trolley. No need to Cover eyes of the baby. Mounted on castors for easy mobility. M. S. Fabrication with powder coated paint . Operation Voltage : 100-250V AC, 50Hz . Compact, Portable & Easy to Carry. Detachable Baby Tray for Cleaning. Low Power consumption (12 W). Irradiance: > 25 µW / cm2 / nm. Can be used separately in mother bed / in trolly . Driven by an intense desire to conquer maximum patron agreement, we render the best quality of Radiant Warmer with Detachable Trolley. Used for treating newborn infants suffering from extreme heat loss, the radiant warmer is known for its ultra-modern microprocessor based controlling. Due to even heat distribution and easy operation, the radiant warmer is highly demanded. As technology advanced, we have kept the warmer simple & easy to use with one touch controls. The heater with reflector makes it easier to work with the baby by efficiently providing even heat distribution across the cradle and not into the surrounding environment. Servo Control is an electronic feedback system which functions as a thermostat to maintain a constant temperature at the site of Skin Probe by regulating the heat output of Radiant Warmer. Maintaining a constant abdominal Skin temperature between 36.5 & 37.0°C is the simplest way to provide a “ thermoneutral” environment, minimizing the no. of calories needed to maintain normal body temperature & reducing the risks of cold stress or overheating. Servo control is the only acceptable method of heat regulation for the Infant cared for under a Radiant Warmer. Air Control is an electronic feedback system which functions as a thermostat to maintain a constant temperature of baby cradle by regulating the heat output of Radiant Warmer. It also acts as a WATCH DOG as Air over temperature cuts off heater even if the Warmer is operating is Servo Mode. The Manual mode allows the Warmer to be kept ‘baby ready’ without nuisance alarms. When needed the Warmer provides safe, powerful & controlled warming to restore the temperature drop experienced by the baby immediately after delivery. Acrylic baby tray with Infant’s Head up / down facility & foam mattress. Provision for positioning X - ray cassette.